Looking for an alternate way to get an easy to use fireplace in your home? 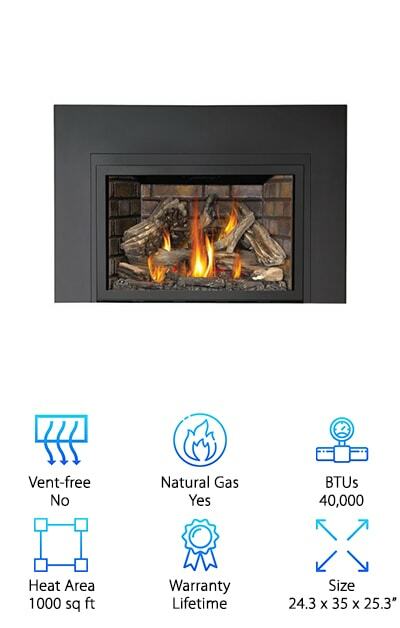 Are you sick of buying gas logs for wood burning fireplaces? There’s a really awesome alternative out there that’s easy to use and sometimes doesn’t even require a vent. We did the research to help find you the best gas fireplaces around. Before we get into our best gas fireplace insert reviews, here’s what you need to know about gas fireplaces before you start shopping. 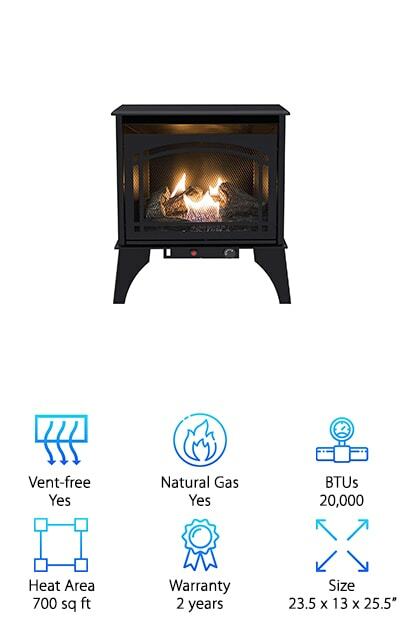 Vent-free: Most of these are vent-free so, unlike a traditional wood burning fireplace, you don’t need to worry about a chimney or anything. That said, there are some that need venting or are meant to be outside. 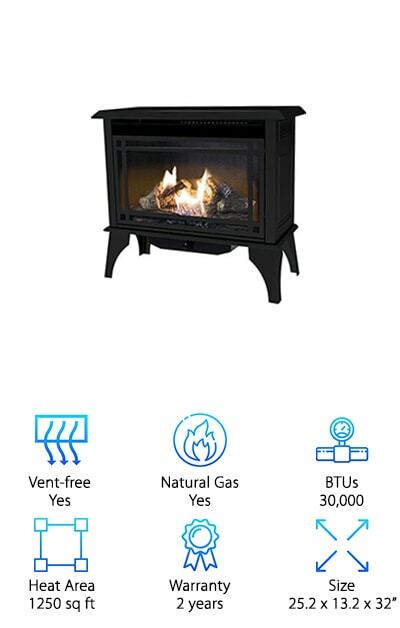 Natural Gas: These gas stoves run on either natural gas or propane. Most of these fireplaces use either one as a fuel source. If they don’t come equipped for natural gas, there’s often an adapter that you can use. BTUs: BTU stands for British Thermal Unit. It sounds like it’s something used in the UK, but it’s not. Technically, one BTU is how long it takes to heat up 1 pound of water by 1 degree Fahrenheit. Heat Area: This is how large of a space the fireplace can adequately heat. You’ll notice that one of our picks doesn’t have an area listed; that’s because it’s an outdoor fireplace. Outdoors, there are no walls to hold in heat. Warranty: The warranties vary on these from 1 year to a lifetime. If you’re going to be installing your gas fireplace by recessing it into your wall, it might be a good idea to make sure it’s covered under warranty for a while. Size: Measurements vary so much from item to item. Some of these are very long and thin, others are square, and a few are even free standing like a wood stove. Make sure you pick the right size for your space. 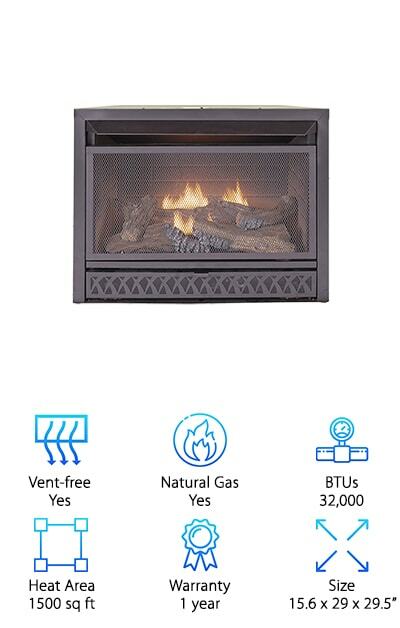 Now that you know a little more about the main features to look out for we can jump into our gas fireplace reviews. Here’s the deal: we put out top pick and budget pick right at the top of the list. If you’re short on time, start there. It’ll give you a general idea of what’s available. After that, continue reading to find out more about the other 8 amazing products that round out our list. Ok, let’s get started! Our top pick is one of the most realistic gas fireplaces we came across in our research. This beautiful piece from Napoleon Grandville it also packed with some pretty great features. One thing that we loved is that it’s so simple! Just flick the on/off switch. That’s it. You can also adjust the flame and heat so you can control how much fuel you’re using and the temperature of the room. There are some great safety precautions, too. The safety screen keeps your family from getting too close to the flames. Plus, there’s an oxygen sensor that will shut off the pilot if the oxygen level is unsafe. One more thing: the included Phazer logs make the flames look as if they’re from the wood. For a gas wood fireplace that has a much different look, the Comfort Glow Gas Stove might be just what you need. Rather than an insert, this is actually a free-standing cabinet made out of heavy-duty black steel that looks like an old-fashioned wood stove. Get this: it even comes with an insert that looks like charred logs so you can create a more realistic looking experience. This stove is also really portable so you can use it in any room. It has a dual fuel technology so you can use either propane or natural gas. And that’s not all, it can heat up a pretty good-sized room, too. How big are we talking? How about up to 1250 square feet. Regal Flame Fargo’s Built In gas fireplace is simply stunning to look at. If you’re into modern design and want something that looks more like art than a fireplace, this one is going to impress you. You can either recess it into a wall or hang it just as you would a flat screen television. We looked at the smallest one available, but if you have a lot of wall space and want something really dramatic, you can it in lengths up to 71 inches long. It runs off of ethanol and the 43-inch version can heat a room up to 850 square feet. One more thing. When running at maximum capacity, it can last 4 to 6 hours. 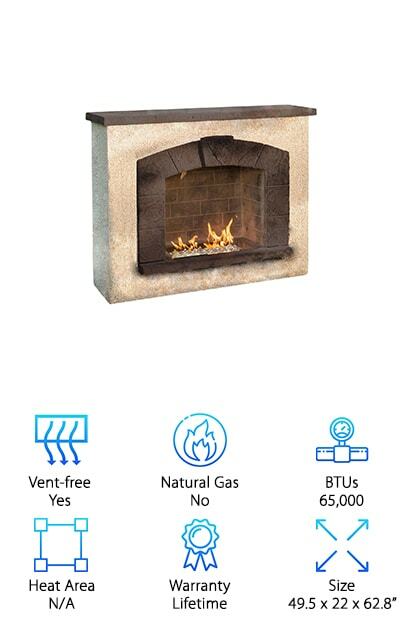 If you’re looking for an outdoor fireplace, check this out. It’s from Outdoor Great Room, which is the perfect name for a company that makes outdoor fireplaces. This fireplace is a little more compact than a traditional one. It’s just the right size to put on a deck or outside seating space. The structure itself is made out of stainless steel and then covered. In the end, it looks like it could have been hand built. There’s a dark brown stone arch hearth and accent and the rest of the facade is covered in exterior grade stucco. It uses propane, though you can get an adapter if you prefer to use natural gas instead. You can easily adjust the flame height, too. It will change the way you use your backyard! There’s no other product on this list that we feel makes a bigger statement than this fireplace from Boulevard. It’s simply stunning. Why do we say that? Well, it’s the widest one we found at a whopping 72 inches. At only 12 inches high, this long, thin fireplace looks more like a piece of art. This beautiful fireplace requires in-wall installation which actually allows you to further customize it. Add decorative trim, liners, or driftwood logs to compliment the look of your home. And get this: there are multi-colored LED lights under the floor surface for a festive touch any time of year. You can wire it so the lights are controlled by the light switches in your room or use the batteries. 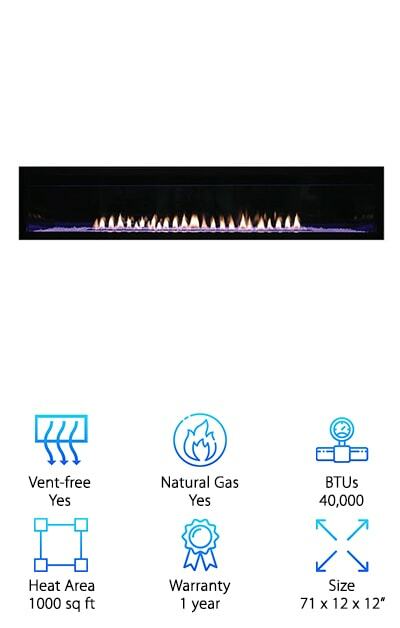 For a high efficiency gas fireplace, check out this insert from Duluth Forge. You can use either natural gas or propane for fuel. Here’s what we really liked about this one. It has zero-clearance. What exactly do we mean by that? Basically, it’s really easy to install. There’s not much to worry about, you just slide it in. To make it look more customized, you can even add a mantle! This one is also packed with a lot of great features, too. There’s an oxygen depletion sensor that turns off the flame if oxygen levels decrease. Plus, there’s battery-assisted ignition which makes it super simple to start. Here’s something else we loved: it heats up a room as big as 1350 square feet. If you’ve been looking at our list and are a little concerned about gas fireplace sizes and if you’ll be able to fit one in your home, we have an answer for you. If you have a smaller space, this Pleasant Hearth gas fireplace is actually a cabinet made of heavy duty black steel. It heats up to 700 square feet and in only 23.5 x 13 x 25.5 inches. You will easily be able to fit this stove into the corner of your kitchen or make it the focal point of your living room. One of the best parts about it is there’s no installation required! Just set it up where you want it to go and you’re all ready to go. We don’t really want to say that this is a cheap gas fireplace; let’s say it’s budget-friendly. It certainly doesn’t look cheap! 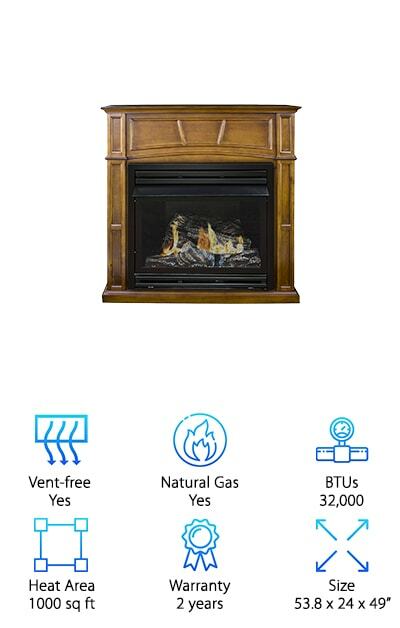 This vent-free gas fireplace is clean burning and let’s all the heat stay right in your room. 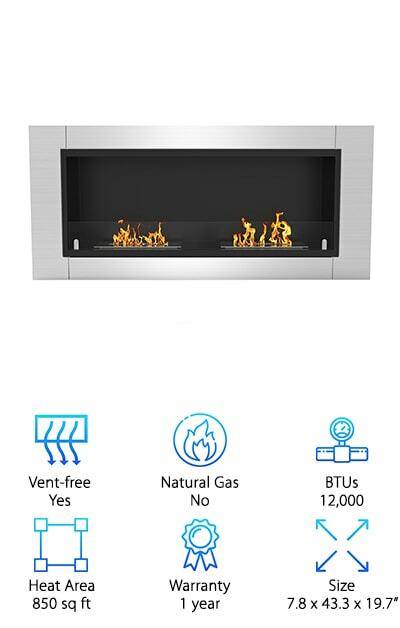 This dual fuel fireplace uses either natural gas or propane to create an impressive amount of heat. What do we mean? Believe it or not, this one can heat up to 1500 square feet! Plus, the included logs make it look like a real wood fire. The insert looks very realistic, too, thanks to the faux painted brick background. There are more things to love about it, too, including an oxygen sensor that shuts the flame off automatically plus an easy to use piezo ignition. Pleasant Hearth is one of the best gas fireplace manufacturers around. They make a lot of fireplace accessories, too, so it’s no surprise that they made out top ten list. One of the reasons they stand out is because they’re really easy to install anywhere, thanks to the zero-clearance design. This dual fuel gas fireplace has 2 rows of flames so your fire will look fuller and more like a wood fire. And get this: starting a fire is as easy as hitting the on/off switch on the included remote control. Or you can set the thermostat for the flame to turn on when the room gets too cold. It also comes with an oxygen sensor that will turn the unit off if the oxygen is depleted. 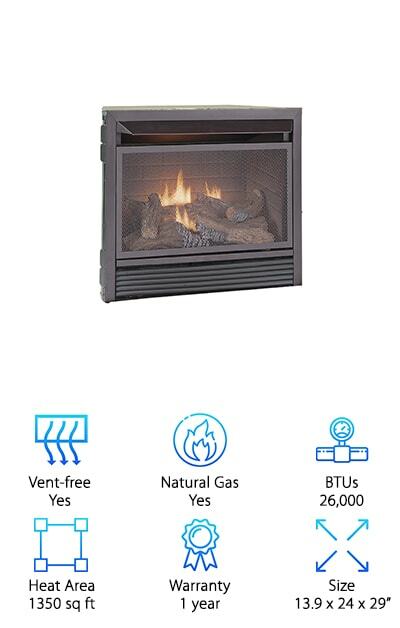 This Napoleon Built-In gas Fireplace is a little different from the rest of our list but we think it’s the best direct vent gas fireplace we found. 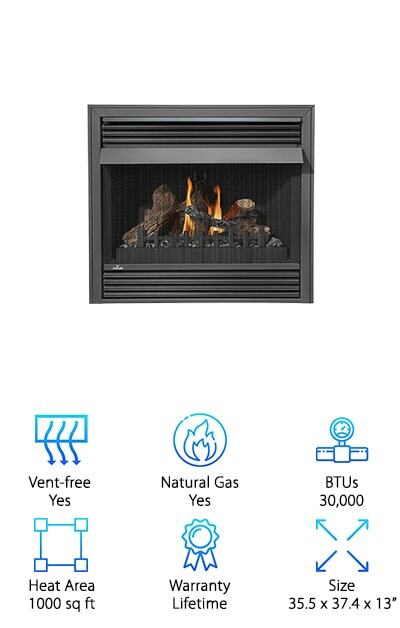 What exactly is a direct vent gas fireplace? Well, as you might have guessed, this one isn’t vent-free. But don’t worry, you don’t need a chimney! This fireplace is designed to be vented directly through the wall or roof. The cool thing about this is it uses the cold air from outside for combustion and keeps more of the warmth where it belongs: inside your house. It has an electric ignition system and a battery backup in case there are issues with the power. Want to create some ambiance without turning on the heat? The night light feature is just what you need.